Fun Drinking Games - Don't miss out on those! Fun drinking games, you ask? What are you, a novice drinker? Okay, judgment aside, every drinking game is guaranteed to bring that needed energy and excitement into a boring drinking night or a weekend party. It all depends on your group's ability as it these games can range from those with the easiest mechanics to games that can require you to use your mind heavily even in the midst of being intoxicated. So, "novice drinker" (just kidding! ), take a look at these following fun drinking games. One fun game that involves luck is called match maker. Do you need to have a match stick to play this drinking game? Yes, it does involve a matchstick being thrown into the table and whoever is nearest the red point of the matchstick will have to face the consequence of drinking. While it may be a simple game with no fuss mechanics, the fact of not knowing to whom the red part will point is what makes this game very exciting. Another fun game, but a little more difficult than match maker. This is actually a grown-up version of the classic child game Musical Chairs and that good thing is that it comes with beers. The same mechanics are employed in this game, with chairs forming a circle and all the players trying to get one once the music ends. Whoever was left out and was unable to find a chair will be required to drink. This would go on until only one player gets the final chair. For nights when the whole gang wants to get drunk easily, I recommend playing the game drag race. This game requires you to have several kinds of alcoholic beverage of your choice. How is this played, you ask? Its rules are pretty much simple, but it can easily get anyone drunk in a short time. The game will be played in laps, three to five laps are recommended, and each player will need to drink all the alcohol lined up. The first player who gets to consume all the drinks will be declared the winner! Looking for another familiar game? Maybe another thing from your childhood? Like Musical Chairs, the drinking game Rock, Paper, Scissors is based on the very same game you play with your playmates or kindergarten classmates. 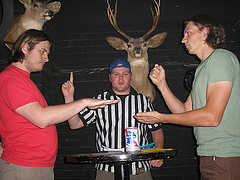 Before starting the game, the group should have come up with the consequence to be faced after a game of rock, paper, and scissors. The game-play is the same with what you have been accustomed and the only thing that made it more adult-friendly is that whenever someone loses, he/she gets to down a drink. These are just some of the games you can try for your drinking night with friends. I suggest to never hesitate in experimenting with these games. And when the time comes that you're already considered an experiment to these games, there will be plenty to be found in the Internet. Novice drinker you are or not, there would always be perfect and fun drinking games for you!